Blended by Litto Gomez's son Tony and handmade at Tabacalera La Flor S.A. in the Dominican Republic, the La Nox is unlike any LFD cigar before it. 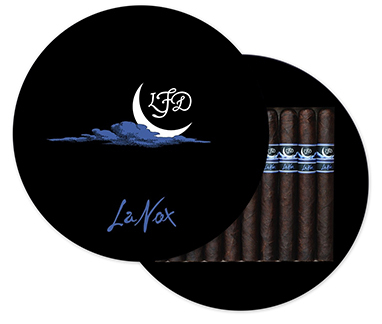 Latin for "night," La Nox is the embodiment of its name with a sweet Brazilian maduro wrapper as dark as the night blanketing a San Andres binder and masterful combination of LFD's own Dominican Piloto and Pelo de Oro filler tobaccos. This medium/full bodied, full flavored cigar is beautifully constructed, elegantly and powerfully blended, complex, and nuanced with notes of coffee, cocoa, cream, nuts, earth, cedar, and light spice. The La Nox is packaged in a unique circular box secured by magnets rather than hinges.